Key Communications provide expert consultation, design and installation and a range of cost-effective priority support and maintenance options to protect your ICT investment, minimise down time and get your systems up and running fast in the event of a fault. 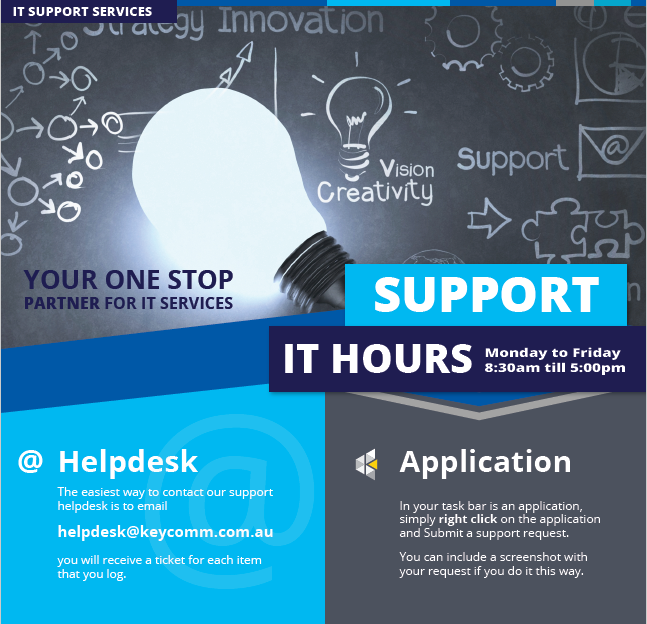 The Helpdesk and application are the easiest ways to connect to IT Support. Please note that the phone number is only as a last resort if all your systems are down and you cannot connect to the internet to contact us. This enables us to log requests and manage our support to you most effectively. Please download our IT Support flyer for your records. We suggest having this at each workstation for informative purposes. Managed I.T. ServicesNetworking SolutionsI.T. ServicesCloud ServicesCabling ServicesSomething Else?